When Eric and Craig Fankhauser, as vice presidents of Toledo Metal Spinning Co. (TMS), reviewed insurance coverage every year with their father, Ken, the family-owned firm’s president, they “always talked about valuations,” Eric recalls. In deciding on relatively low coverage, they assumed that any fire could be contained to a small area because their plant was mostly brick and metal. “It” was a disastrous fire that ravaged much of TMS’s plant in February 1998. Not all of their loss was covered by insurance, and if the entire plant had been destroyed, “we would have been way underinsured,” Eric says. Two fire doors were all that prevented the blaze from completely destroying the plant. The tape was sent to England so the data could be salvaged by a company there. In the meantime, TMS had to rely on a four-month-old backup tape that Craig had kept in his briefcase. The Fankhausers “set up a war room” with the September backup tape as a database, Craig says, “and started plugging away at it.” They purchased computers on Friday – two days after the fire – picked them up on Saturday, and were back online Monday. “Eighty percent of our business is repeat business,” Craig says, so we had shop routings and process flow and tooling and telephone numbers and contacts [ on the backup tape]. The majority of our information was there.” They were able to contact all their biggest customers using information from the old tape. 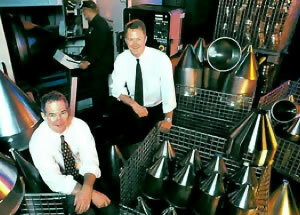 Those customers had turned to TMS for parts for missiles, passenger jets, and military aircraft, among other things. The company’s forte is “basically, anything that can be formed out of metal,” Eric says, and so it has a “very, very diverse” customer base. Spinning, the process from which the company takes its name, involves rotating a metal disc at high speed and pushing it down gradually over a form called a mandrel. TMS sells off the shelf a whole line of stainless-steel, cone-shaped hoppers used for countless purposes — from releasing fruit into yogurt to processing pills. By the time of the fire, Ken Fankhauser was less active in the company, although he retains the title of president. “My brother and I have pretty much been running the company for the last 10 years,” Eric says. Craig, 40, handles sales and information systems, and Eric, 37, the financial side and quality control. Farming out their work to other companies, in Toledo and elsewhere, was difficult, in part because “we’re extremely picky on quality,” Eric says. Mainly, TMS concentrated on getting back into production itself as quickly as possible. “The fire was on a Wednesday night,” Eric says. “We were back in primitive production on Friday, when we took a lathe from polishing and converted it to a turning lathe” to complete a job for a customer that otherwise would have lost $50,000 for every day the parts were delayed. They got their first replacement machine, a metal spinning lathe, the following Wednesday; its German manufacturer was shipping it to another customer, which agreed to let TMS buy it instead. Some customers didn’t get deliveries for several months. “It got pretty hairy in June or July, when there were still some customers we hadn’t delivered to,” Eric says. “If I had to draw a stress curve, it would peak about the middle of July,” just before the larger of two replacement buildings was ready ( a smaller building had gone up by April). TMS’s 1998 sales, despite the fire, were 83 percent of 1997’s, and the Fankhauser brothers hope that 1999’s sales will rise to 1997’s level. Rather than simply reproducing the company as it existed before the fire, though, they’re trying to improve it. “We’re redesigning our whole production system,” Eric says, by adopting the principles of “lean manufacturing” — the Japanese system, known as kaizen, that emphasizes flexibility — with the goal of providing much more rapid turnaround.